Leading independent oil company Phoenix Petroleum Philippines and leading carrier Cebu Pacific marked a decade of strong and indispensable partnership with the signing of a renewable supply contract recently. Under the agreement, Phoenix Petroleum will construct a Jet A-1 storage facility in Tayud, Consolacion, Cebu, to be used by Cebu Pacific to store their Jet A-1 fuel. Universal Robina Sugar Milling Corporation (URSUMCO) also signed a contract with Phoenix for the latter to purchase and distribute all the ethanol production of URSUMCO. 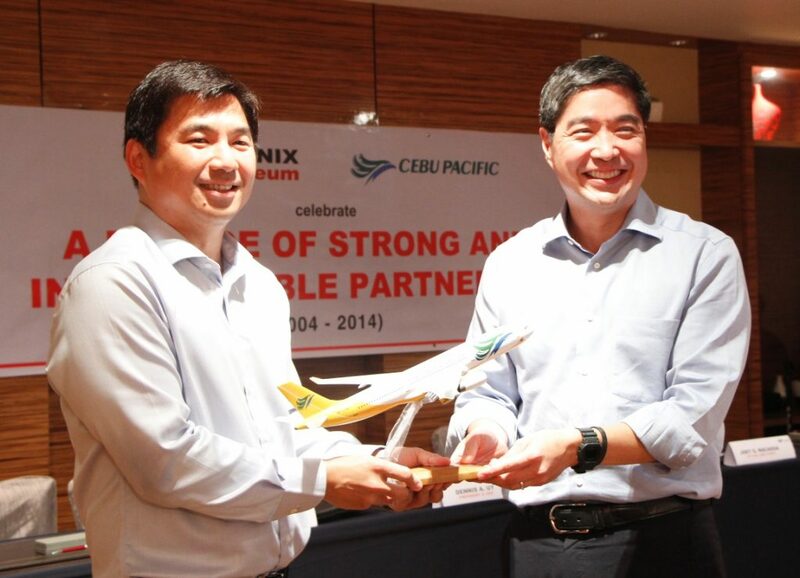 The signing was led by Phoenix President and CEO Dennis Uy and Cebu Pacific President and CEO Lance Gokongwei on August 28, 2014 in Manila. In 2004, Phoenix Petroleum started as a small company in Davao involved in storing and transporting fuels. It got its biggest break when it became the exclusive logistics partner of Cebu Pacific in Mindanao. Today, Phoenix is the dominant supplier of Jet A-1 fuel to Cebu Pacific nationwide. The partnership has proved effective because of shared strengths: both are Filipino-owned companies, both started as small players in huge fields, both are entrepreneurial companies, both are led by young and dynamic leaders, and both started in the provinces that expanded throughout the country. After 10 years of strong partnership, Phoenix Petroleum and Cebu Pacific are leaders in their own fields. Phoenix is the number one independent oil firm, with more than 400 retail stations nationwide, and is the 36th largest corporation in the country. Cebu Pacific is the largest domestic airline operator in the country, flying to 24 international and 33 domestic destinations. It is the sixth largest low-cost carrier in the Asia-Pacific region. Phoenix Petroleum signed contracts with Cebu Pacific and Universal Robina Sugar Milling Corporation during the celebration of its supply partnership with Cebu Pacific. Leading the signing on August 28, 2014 in Manila were (from left) Phoenix Petroleum COO Romy de Guzman and President and CEO Dennis Uy, Cebu Pacific President and CEO Lance Gokongwei and VP for Fuel and Cargo Joey Macagga, and Universal Robina Sugar Milling Corporation BU-General Manager Rene Cabati. Phoenix Petroleum Philippines President and CEO Dennis Uy (left) receives a die-cast model of a Cebu Pacific Aircraft from Cebu Pacific President and CEO Lance Gokongwei (right) during the celebration of their 10 years of partnership.